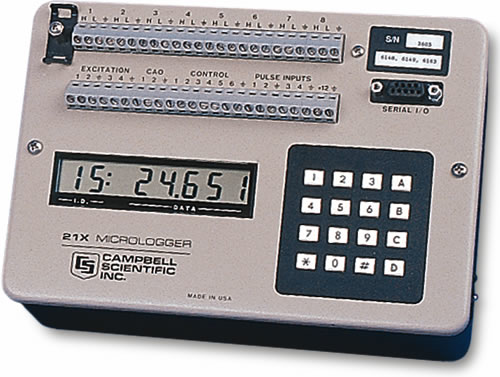 The 21XL Micrologger featured a self-contained package that had an integrated power supply, keyboard, and display. Its on-board power supply contained sealed rechargeable batteries. The 21XL provided 8 differential (16 single-ended) analog input channels, 4 switched excitation outputs, 2 continuous analog outputs, 6 control ports, and 4 pulse counting channels. It had a CS I/O port that was labeled Serial I/O; an SC32A or SC32B was required for communications with a PC. The 21XL stored up to 19,296 data points in its internal memory. Internal software PROMs (Firmware), ac rejection, and temperature testing were ordered at time of purchase. The 21XL needed three PROMs for any Windows software to communicate with it. Two PROMs had only three *B windows; three PROMS had nine *B windows.For descriptions of PROMs, see Ordering Info.